This is a sponsored post written by me on behalf of Total Wine & More. All opinions are 100% mine. What do you get for the grown ups on your Christmas list? My favorite gift to give (and let's be honest to receive) is wine. Everyone from my sister to my neighbors to my mom friends appreciates a great bottle of wine. This year I'm adding a bit more to make my wine gifts even more special. 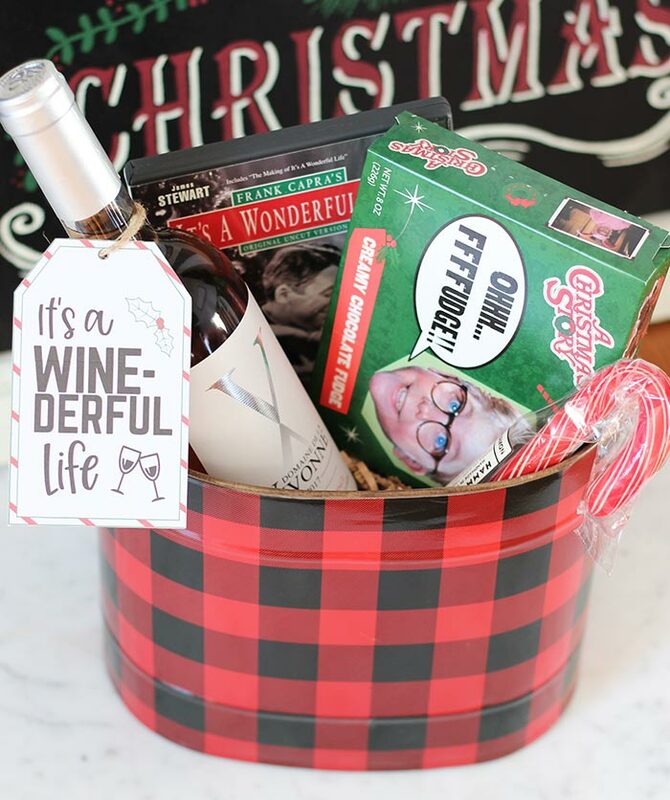 These 4 fabulous wine gift ideas for Christmas are ones that everyone on your list will love and I'm making gift giving super easy for you with free printable gift tags too! 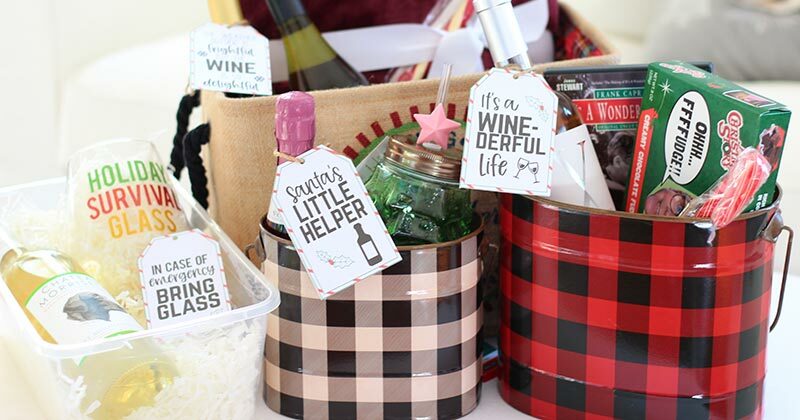 These wine gifts are easy to put together when you know where to shop. Total Wine & More is your one stop shop for wine and accessories that everyone will love. I was able to pick out something special for all the wine lovers on my list (and maybe something for myself too). PS - want to SAVE on your wine gifts this year? Click here to get a coupon for $10 off your $50 purchase at qualifying Total Wine & More locations​. Ready for some great wine gift ideas for Christmas? Here you go! Nothing is more fun than during the holidays than pouring a glass of wine and settling in to watch one of your favorite Christmas movies. This gift is perfect for that! Grab a bottle of your favorite "this wine's not bad, but not good either" (Can you name what movie that is from?) to make this holiday movie themed gift. Add a DVD of your favorite Christmas movie and some of Ralphie's famous FFFFudge. A gourmet candy cane, some popcorn, and your gift tag make this present complete. Don't tell my mom friends but they are all getting this for Christmas this year. This is a super cute and simple way to give the ladies on your list a sweet gift. 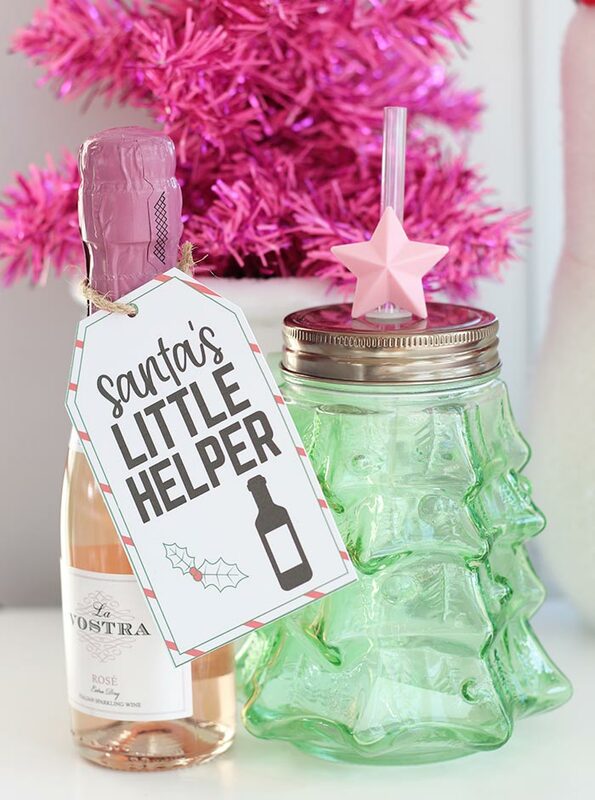 Pair a pretty pink mini bottle of sparkling wine with this Christmas tree sipper. 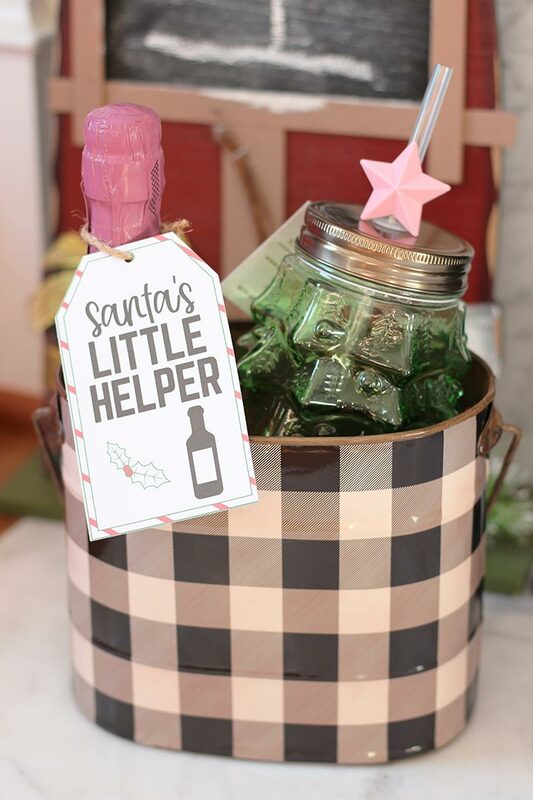 It's a fun take on the traditional mason jar glass and I just love the pink star on top. Package this in a fun buffalo check tin with your gift tag and you have a gift she is sure to love. This makes a great couple gift and is perfect to get anyone through the long winter. Bundle two bottles of your favorite wines with a cozy blanket. 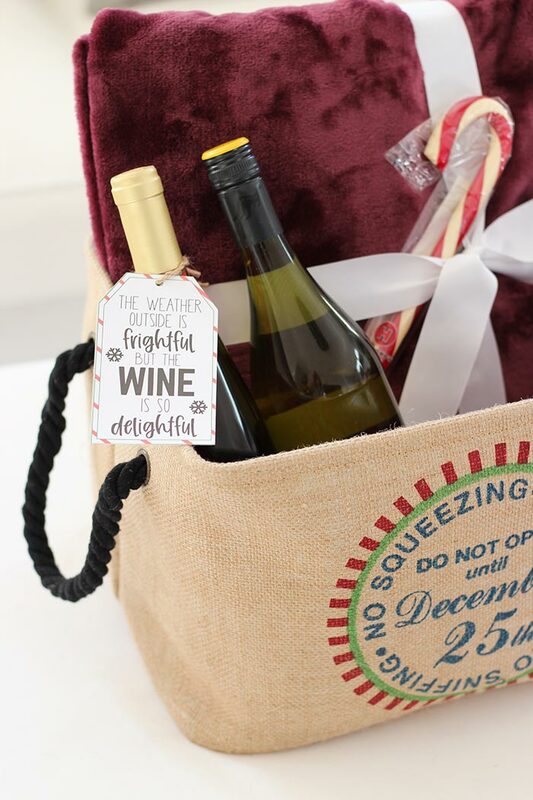 Package it in a burlap tote that they can use to store their blanket, add the gift tag, and you have a gift they will remember long into January. I'm going to be completely honest here. I love this so much I am keeping it for myself. And making several more to give as gifts. This is such a fun idea for a white elephant Christmas party, gift exchange, or just about anyone that loves wine and has a sense of humor. Pair your favorite wine with this HUGE (30 oz!) Holiday Survival Wine Glass. Add in the gift tag and place the entire package in a plastic shoe box size bin. 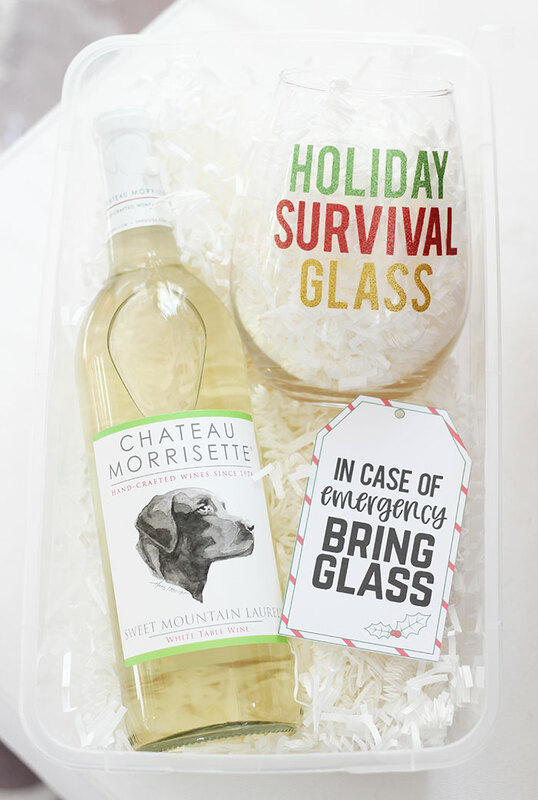 Now you have the perfect emergency sanity saver for all your holiday moments. As promised, I'm making these gifts super easy with FREE printable gift tags. 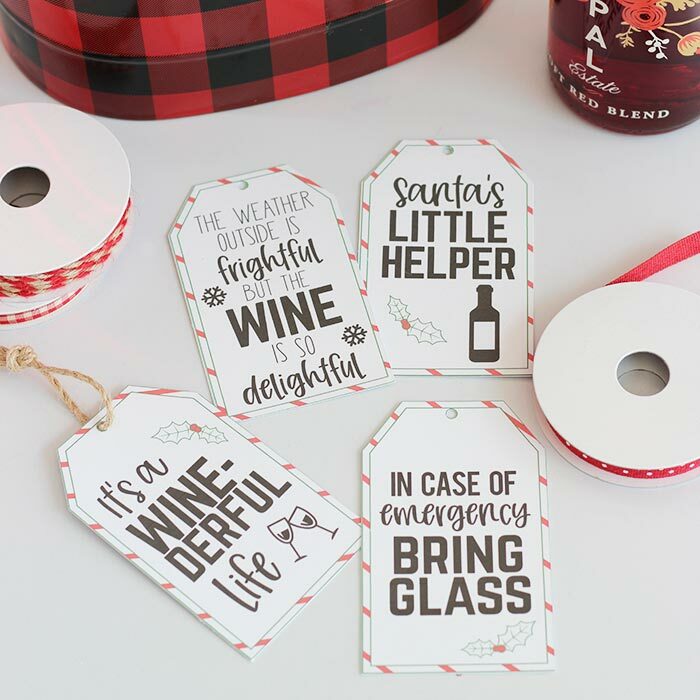 So after you've stocked up at Total Wine & More, you can download and print these tags to make your wine gifts extra special. Simply click on the button below to get yours. You'll get all 4 tags on one printable PDF page. I recommend printing on card stock for best results. Want even more fabulous Christmas ideas? Check out Total Wine & More's Holiday Gifting Guide and Holiday Entertaining Guide for all your holiday needs.